Ben and I have a cozy, wood-burning fireplace, which, after 15 months in our home, we have lit exactly zero times. I’m hoping our first snowfall will inspire us to finally light the logs, but in the meantime, I’m keeping myself warm beside the slow cooker of Hot White Spiced Wine instead. Our failure to take advantage of our fireplace feels rather criminal. We have a large stack of wood in the backyard for fuel, all of the fireplace tools we need, and plenty of chilly winter nights to merit the flame. My issue is inertia. On my couch, I’m an object at rest, and I will stay at rest, particularly if it’s cold and icky outside. Ben’s issue is fear. He assumes that if we light a fire, we will ignite the house in the process. Considering I once lit our oven on fire by allowing an especially cheesy casserole to bubble over, his unease is not entirely unfounded. This slow cooker spiced wine could be the final catalyst that spurs me to kindle the flame—and by “me,” I mean, “Ben.” Eight seconds of watching me fiddle with the matches should be enough to convince him to take over. Actually, I’m counting on it. I never earned my Girl Scout campfire merit badge. 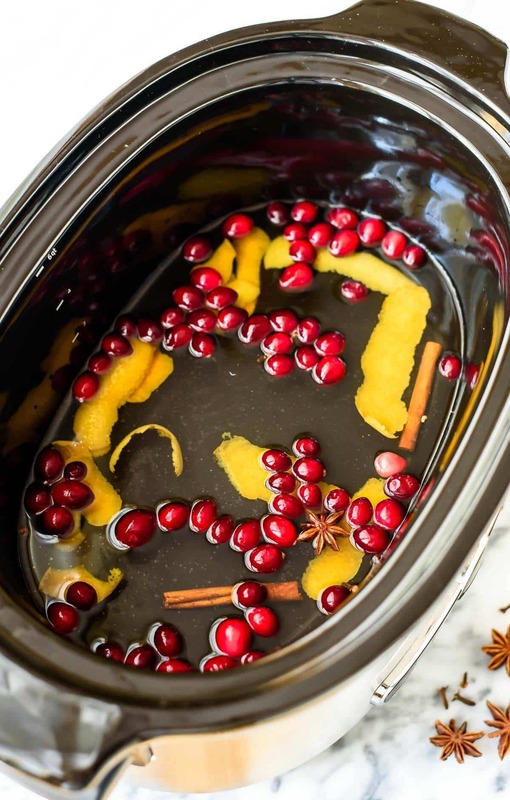 Spiced with warm cinnamon and cloves, infused with refreshing citrus, and sporting the red and green pop of cranberries and rosemary, this slow cooker mulled wine is so cozy, I can’t help but envision us sipping it beside our hypothetical roaring fire. In my idyllic white-spiced-wine-sipping scenario, we’ll wear chunky cable knit sweaters, jazzy holiday music will play, and you’ll say something witty. I’ll laugh and pour us refills. Really, it couldn’t be a prettier scene. Maybe I’ll even borrow a friend’s Labrador retriever so that he can curl attractively in the foreground. I like this holiday picture. Or, you can come over in your sweatpants, and we can sit on the kitchen counter, right next to my slow cooker, and just ladle refills into our glasses. I like this idea too. 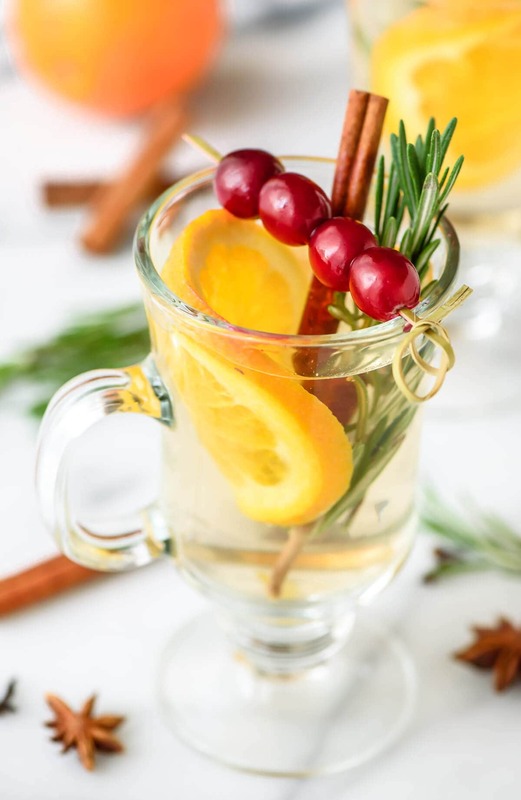 Whether you make this white spiced wine for a formal holiday party, a quiet night at home, or a casual evening with close friends, this warm, wintery drink hits the spot. Hot spiced wine (also called mulled wine) is a drink I look forward to every holiday season. This more classic red slow cooker spiced wine is one of the most popular recipes on my site, and I thought it would be fun to update it to a festive version with white wine. 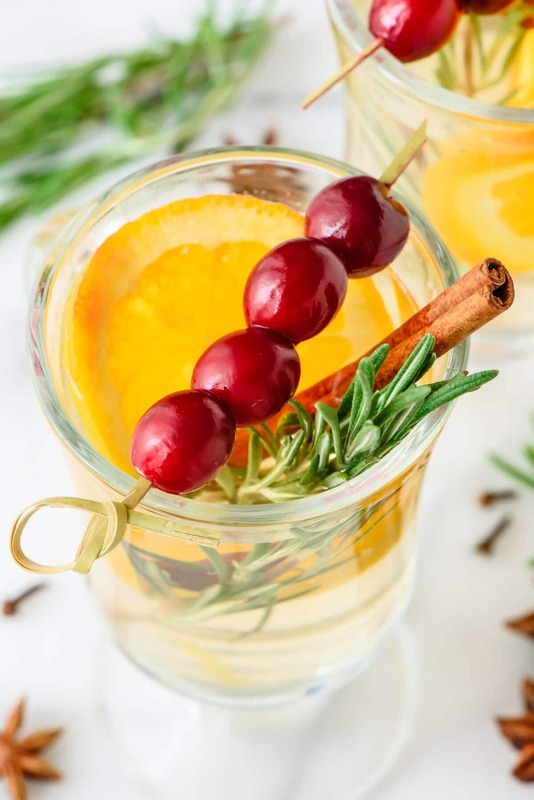 For the mulled white wine, I swapped the red wine in my original recipe for white, added white cranberry juice to sweeten, and then tossed in cranberries for their red color and rosemary for the green. Add a splash of rum, and you have a spirited holiday cocktail that’s festive and dressed to impress! 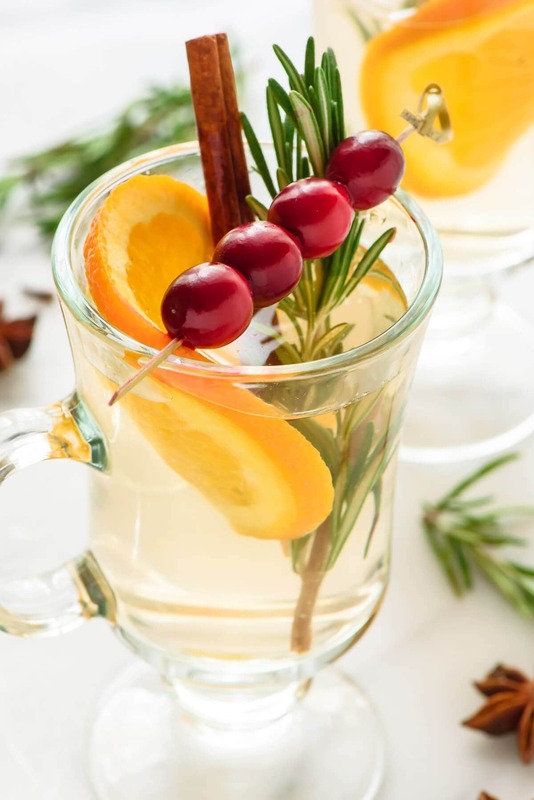 Slow cooker white spiced wine is the ultimate holiday party drink! 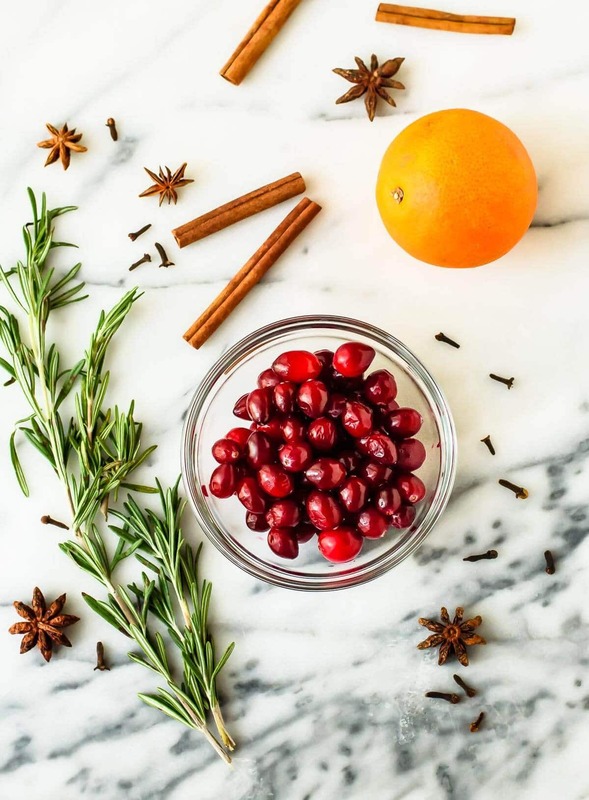 With red cranberries, green rosemary, and warm spices, it's beautiful, festive, and easy! Find the full recipe directions on the KitchenAid blog, where I am a contributor. Thank you! I’m sharing this post in partnership with KitchenAid, for whom I am a regular blog contributor. Thanks for supporting the brands and companies that make it possible for me to provide quality content to you! Wow, this looks so festive and enchanting! I’m much more of a white wine than red wine kind of person, so this is right up my alley. I’ve already got the labrador (mix), but alas, no fireplace…the scene you’ve set sounds absolutely perfect, though! Wine that you don’t have to lift a finger to make? Sold! I’ll take two pa-lease!